Over the last 30 years or so, Benchmade has made quite a name for itself in the knife industry and any knife enthusiast will tell you they are highly respected in the community. They have proven to be a revolutionary force in knife making, employing impressing quality control standards and combining excellent designs with today’s technologies to bring you formidable blades at a reasonable price. In addition you can opt for straight or partially serrated blade as well as a satin or black coated blade. Benchmade really has spoiled you for choice here. In my review I’m focusing on the Barrage 581. Note the mini-versions have a 2.91″ blade and 4.00″ when closed. The 586 mini weighs in at only 3.87 oz. 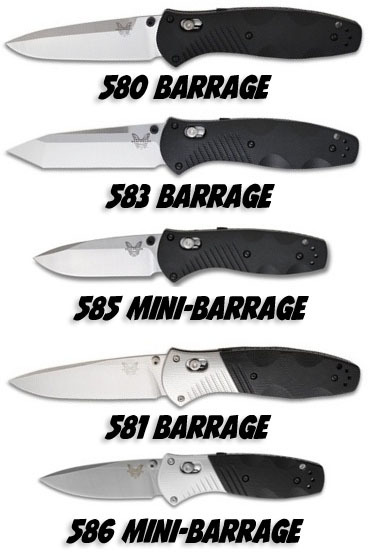 The Benchmade Barrage 581 (and mini 586 model) was introduced in 2011, subsequent to the 2009 release of the original 580/583/585 versions. The 581 sports a 3.6” blade made of Bohler’s M390 Super Steel (more on that later) and the overall length of the knife is 8.35” fully deployed while 4.75” closed. It weighs in at 5.2 ounces, which I know is a bit heavy for an EDC but I know folks who do indeed carry the 581 Barrage on a daily basis without issue. In contrast, the blade on the 586 Mini-Barrage is only 2.91″ and weighs 3.87 oz which is still heavier than the 940 Osborne by example but still well within EDC territory. As mentioned above there are various configurations of the Barrage 581 series, including a straight or partially serrated blade and for a more tactical look you can also get the knife with a flat black “military grade” Cerakote Gen II finish coating over the M390 Super Steel. The Tanto blade is only available in the original 580 design which uses 154CM steel and Valox (plastic) handles. 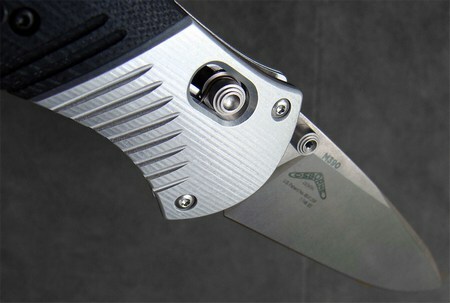 The blade on the Barrage 581 is a standard, but beautifully executed, drop-point design with ambidextrous thumb studs. This blade is made from a 3mm stock, with a partial hollow grind to give it an excellent, durable edge. The real feature of this blade is the use of the outstanding M390 super steel. M390 Super Steel is a premium steel from Austria’s Bohler which is produced by powder metallurgy. It has formidable resistance to wear and tear and can be hardened to around 60-62 HRC Rockwell with proper heat treatment. This steel is one of the best out there and many will tell you it’s superior to Crucible’s S30V when it comes to holding an edge. M390 is commonly used in surgical cutting instruments, so you know this baby can take and hold a super-sharp edge! As expected my 581 was hair-whittling sharp and perhaps the best I’ve seen from any Benchmade. Don’t expect sharpening to be a piece of cake though…these super steels are super hard which means when they need to be sharpened it can be a struggle. The handle of the Barrage 581 is manufactured from G10 with aluminum bolsters. An interesting design for sure and I actually like it a lot. It many ways Benchmade has fused a tactical appearance in a gentleman’s style which you don’t see often. It is a bit on the thick side, but fills the hand quite nicely and is equally ergonomic in either standard or reverse grip, an important characteristic for a tactical knife. Finger indents machined into the G10 scales provide excellent gripping points, allowing you to maintain a strong grip on the knife even when your hand is slippery from sweat. The pocket clip on the Barrage 581 is Benchmade’s standard split-arrow design, and it retains the knife in my pocket very well. You are limited to tip-up pocket carry, but the knife does provide screw holes on both sides of the handle for ambidextrous carry options. The knife rides nice and low in the pocket, with very little (if any) visibility. The 581 features Benchmade’s patented AXIS-Assist opening and locking mechanism, and the blade deploys with extreme speed and safety. If you are not familiar with the AXIS locking mechanism, it consists of a small deadbolt-like steel bar extending to both sides of the knife. The bar spans the liners, and is positioned over the rear of the blade. When the blade is opened, the bar engages into a ramped tang at the end of the blade to hold the blade open, and then you slide the bar back with your thumb to close the knife. It takes a bit of practice to do this one-handed, but it can be done once you get the hang of it. The blade locks up nice and solid, and there is no play at all in the blade, either left-to-right or up-and-down. Without doubt this is one of the best locking mechanism’s out there. Unfortunately, when the knife is closed you can press the blade against the stainless steel liners. However, I haven’t seen the blade rub against the liners when opening or closing, and this blade has some very tight tolerances that would mean severe rubbing on a lesser-quality tactical knife. Interestingly, Benchmade chose to cover the pivot with the aluminum bolster so you won’t be tinkering with it on a regular basis. After a couple of months of use I can say my favorite feature of the Barrage 581 is the way the blade holds an edge so well that I rarely need to sharpen. However, as mentioned earlier, sharpening does take a fair amount of time and effort, simply because of how strong the M390 Super Steel is. I am tempted to practice using my bench grinder to sharpen some of my less expensive knives, since it would really make the job easier (and I don’t want to ruin the blade on a $200 knife). I have used my Barrage to cut paper, rope, cardboard, and even thick plastic with ridiculous ease. The blade and handle design make it a terrific tactical knife, even though the model I bought does not have the tactical black appearance. There are only a couple of negatives to the Benchmade Barrage 581 in my mind. I found the texture on the G10 scales is a bit on the rough side, which is good for grip but bad for tearing up your hand with heavy usage. If you plan to use the knife heavily, I would probably recommend wearing gloves to protect the palm of your hand from abrasion. To be honest, this design flaw surprises me, since how a knife feels in the hand over extended use is supposed to be a mandatory consideration in Warren Osborne’s designs. Secondly, the Barrage 581 could stand to have some jimping on the thumb ramp. The thumb ramp is very smooth, and my thumb occasionally slips along the back of the blade. There are ways aroudn this if you’re willing to make some modifications, but it would be nice if Benchmade paid some attention to this detail. Overall, I am extremely happy with the Benchmade Barrage 581. It is a very well crafted knife, which holds a razor-sharp edge for weeks at a time even under heavy usage. If you are looking for either a large EDC knife or a good tactical knife for those unexpected self-defense situations, you should strongly consider the Barrage 581 against peers like the Spyderco Paramilitary 2, Zero Tolerance’s 0550 and Benchmade’s own 940/943 Osborne. What’s more, if the 581 is too big for you then you can simply opt for the 586 Mini-Barrage. Benchmade has covered all angles here. I’ve reviewed several Benchmade knives this year and continue to be stunned by the quality and performance. I still point most consumers looking for a sub-$120 EDC to the Griptilian, but at the $200 level the barrage is a strong contender for your money. Perhaps Benchmade's finest blade to date, the 581 Barrage is a top contender in the $200 category.